Toolboxes provide storage solutions for truck drivers, providing extra storage capacity to keep their important items safe whilst driving. 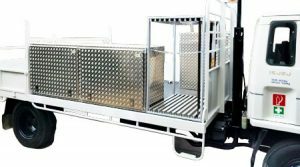 Ute Safe recognises the needs and requirements of their truck customers and provides the best aluminium truck storage boxes solutions. Although these boxes are relatively more expensive they are durable and custom designed, therefore you can get the boxes made as per your demands. By using truck storage boxes you can ensure that your tools remain safe and are not damaged as they won’t get thrown around like they would if they’re kept without a box. It is a reliable storage area. They also prevent loose tools, which if left unprotected in utes, from getting stolen or damaged. When parked in public places, anyone might just get a chance to steal this equipment. However, if you buy a storage box designed with a lock you can keep it in your vehicle safely without worrying about such issues. Hence, these truck boxes serve two very important purposes. They add more storage space and help store everything in an organised and easy to access manner. These boxes can also be used for absolutely anything. Whether it is your work related equipment or if you want to transport items for your hobbies such as golf clubs and rifles. These boxes can be convenient; however you must choose from a wide range and make sure that the one you choose meets all your needs.